Golden is lucky to have a free Community Gallery next door to the Foothills Art Center and from September 3 – November 22, 2013 you can pop in to see Mountainside Miniatures, the annual national exhibition by the Mountainside Art Guild. Foothills’ newest show opens on Friday, September 20th with the 40th Annual Rocky Mountain National Watermedia exhibition. 80+ works selected by juror Skip Lawrence, the paintings in the 2013 Rocky Mountain National Watermedia exhibition showcase the best of the nation’s watermedia artists.Golden has oodles of public art, just hanging and posturing around for your pleasure. A few of my secret favorites: The “History of Mining,” originally located in San Francisco and commissioned by the Golden Gate Exposition; now adorning the upper walls at the Colorado School of Mines Geology Museum, “Building the New Road,” commissioned by the Works Progress Administration is located at 621 12th Street on the upper west wall of the main Post Office lobby, “Winter Wind On The Mesa,” on the Clear Creek Trail southeast of the Washington Avenue Bridge; one of over 20 public art monuments in Golden! Miners Alley Playhouse is an intimate 120 seat theatre featuring award-winning professional theatre at affordable prices and at a very convenient location. Enjoy delicious varietal wines, specialty cocktails, or boutique beers before the performance. Visit their website for a schedule of performances, concerts, classes, and workshops. Miners Alley Playhouse is also the home of Lillie's Saloon - a full bar and lounge in the lobby of the theater. Housed in a historic facility and surrounded by a sculpture garden, Foothills Art Center features two exhibit halls. The Main Gallery showcases blockbuster exhibits while the free Community Gallery features local shows. This summer, the Main Gallery hosts Ansel Adams: Masterworks, which includes some of the photographer’s most famous works and incorporates aspects from local partners such as the Colorado School of Mines and American Alpine Center Library. This festival will screen films from across the globe. Running from two minutes to a little more than an hour the films make up the largest festival of this kind between the coasts. Looking to purchase art? Many of our great local businesses offer steals on taking home a piece of Golden. Lucky Star Ranch features Southwest jewelry across a variety of styles and for all occasions. Spirits in the Wind Gallery also includes pottery, sculpture, home décor, and outdoor art offering you the chance to take home a visual memory of Golden. From local jewelers to goldsmiths, Golden’s local artist offer art combining the Southwest feel with the Golden community history! 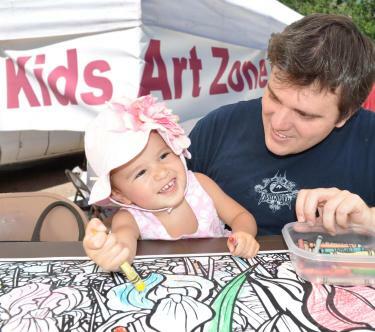 One of Golden’s favorite artsy events is the Golden Fine Arts Festival, which runs August 15-16 in downtown Golden and is free and open to the public. The festival is a juried show and features more than 130 artists in a variety of media, including ceramic arts, fiber arts, glass, jewelry, mixed media, painting, photography, sculpture, and 2D. Art lovers, explore the local merchants of Golden and see what might be your next great creation or find!